For some, winter means cuddling up in front of the fire with hot chocolate and waiting for spring. For others, it’s full of outdoorsy possibilities! If you’re lucky enough to live in the right kind of climate, getting out and enjoying the snow is number one on extreme sports fans’ lists. Kahtoola MICROspikes Pocket Traction System is yet another offering from Kahtoola that makes the enjoyment of winter that little bit safer. The Kahtoola MICROspikes Pocket Traction System is a slip on set of spikes that’ll secure your footing when you don’t need crampons (though Kahtoola do some pretty nifty crampons too!). 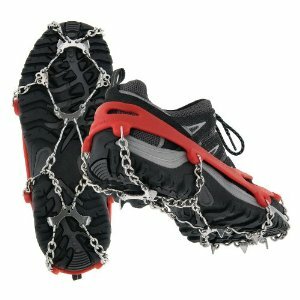 Safe to use on ice, scree, snow, wet rocks and pretty much any slippery surface, these chain-linked spikes are all-in-ones that’ll fit comfortably in your pocket, ready for when you need them. The top harness is made of elastomer that makes sure the traction system doesn’t go anywhere. The stainless steel spikes and chains are extremely durable and will last you through plenty of uses and winters. Even if you do find they wear through, Kahtoola offers a year-long guarantee on their products so they will replace them if necessary. They are easy to put on and take off meaning you can call upon them as and when you need them. The construction of the Kahtoola MICROspikes Pocket Traction System means that they are not safe for wear inside – especially on lovely wood floors! The traction quality of these spikes is widely complimented and is better than a lot of competitor products. On the downside, these little beauties don’t come with any kind of storage bag. Once you’ve used them in even slightly muddy, sludgy conditions, you’ll end up with a rather filthy bag/pocket/wherever you carry them when you’re done. This could be a handy little development for the next incarnation of Kahtoola MICROspikes Pocket Traction System. The traction system isn’t cheap; most places will sell them for $40-$60 a pair. But it’s worth it for the safety element they will bring to your winter exploits. Anyone who’s ever had a nasty fall on the ice will testify to that. The lightweight, portable nature of these spikes will appeal to anyone who spends time on slippery surfaces. Being able to pull them out of your pocket and slip them on with ease is a tremendous reassurance if you live in an area with unpredictable surfaces. Once they’re on your shoes, they grip well and don’t move about. If you go out walking in groups and find yourself slipping behind in tricky conditions, investing in a pair of Kahtoola MICROspikes Pocket Traction System will soon put you at the front of the pack. This entry was posted in Other, Reviews, Snowshoes, Spikes and Crampons and tagged Kahtoola, Spikes, Winter Sports. Bookmark the permalink.